Breakfast on the deck. Our last morning. I cannot resist the play on words. Therapy is great and with wine labels such as Freudian Sip and Pink Freud, it’s obvious that Therapy Vineyards leverage their moniker to delight the palate and tease the brain. After 3 nights of staying in their guesthouse, I must agree. There’s great therapy to be found amongst the grapes for all the senses and all issues! Spending time on the Naramata Bench as well as in the southern Okanagan wine country was amazing Couple’s Therapy (that’s what you call it when you buy two bottles of wine in a bag at Therapy Vineyards). But now, to make the big decision. And it is big. From the realization that April may not be the most ideal time of year to get married on The Bench, to where do we hold it, C.C. and I have not yet made a decision. C.C. likes to be involved, and being involved in planning our wedding is important to him and to me. But it does take some adjustment on my part to make space for a male perspective in the decision-making. Did I mention that along with being a control-freak, I do like to get my way! So, we talk. We balance. We go back and forth on what is our next course of action. And sometimes, I get annoyed. Impatient. My neural pathways are littered with subconscious mappings that dictate the way female/male relationships should work and not even wine has managed to smooth out their edges. So I breathe, have another sip and breathe again. While I like to think of myself as a free-spirit, a liberated woman who does not buy into male/female stereotypes I am discovering there are within me ancient pathways into ‘how things are done’ that muddy up the road to relational harmony. There is only one way through any discourse and that is to keep going through it. The conversation is the relationship and when we agree to keep engaging in the conversation with love and mutual respect, we keep strengthening the relationship. It is one of the gifts C.C. brings to our relationship. He doesn’t defer or abdicate. He participates, especially in the big decisions like, where and when will we get married. One thing about the past weekend, we both know getting married at a winery in the Okanagan is what we want. What the Naramata region offers is a delightfully rural yet in no way “hick” joie de vivre and a more intimate sense of being in the vines. And the views of Lake Okanagan are outstanding no matter where you are on The Bench. On Tuesday morning, we chatted with the delightful Natalie, guest-house manager at Therapy, who had lots of great ideas on how we could hold the wedding in their vineyard. It would involve a tent on the flat piece of land in front of the guesthouse as well as a caterer. All doable she reassured us, especially as her partner Casey is a chef and caterer. Later, René Massinon, the managing partner at Therapy, toured us through the vineyards and the cellars, passionately describing the process of growing, cultivating and harvesting the grape and we knew — Therapy had taken hold! We are completely besotted with the beauty of the place and the hospitality of our hosts. Then, C.C. and I went off to meet with Kendall the events/wine-shop manager at Bench 1775. And we both knew, we’d found the place. Situated just a few kilometres south of Therapy, Bench 1775 has a large enough space to crowd indoors should the weather be inclement and a huge spacious patio that provides an outstanding 360 degree view of the lake and Okanagan valley. We didn’t get a chance to taste their wines, that’s a ‘next time’ event. But we feel happy with our decision. What’s great about Bench 1775 is we can still keep Therapy in the mix as their guesthouse is ideal for sleeping 16 to 22 people. 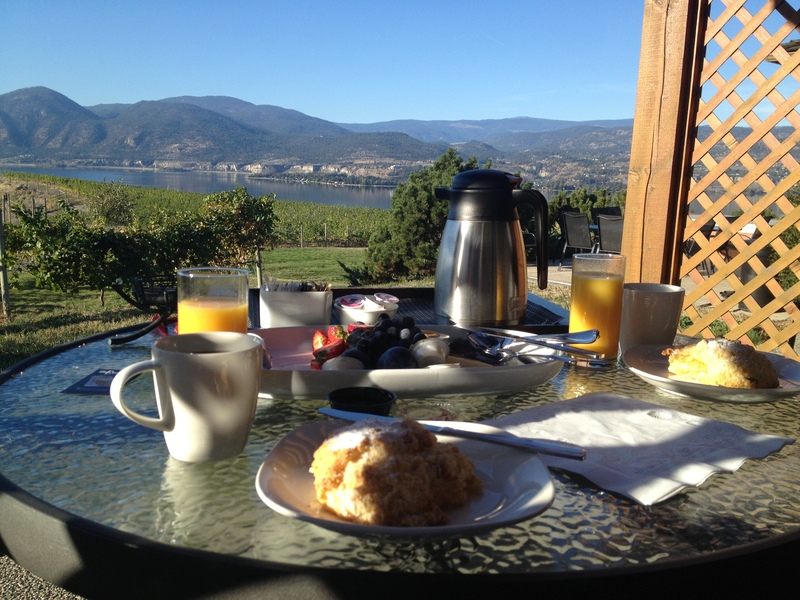 With Penticton just moments away, as well as the quaint and delightful Naramata Heritage Inn and Spa just down the hill in the town centre, our guests will have lots of beautiful options as to where to rest their heads. And now…. to really commit. An April wedding or do we wait until the fall? The beauty of the fall is undeniable. But, there is something about Spring. The sense of new growth, new life coming out of the earth, just as a marriage is a statement of the beginnings of new life in a relationship. It isn’t about the time of year — if only my psyche could grasp that it is not the weather that will make the event great, it is the people! This weekend we’ll be cracking open one of the bottles we brought home and savouring the conversation and the wine as we spend some time going through my notes and measuring our options and the possibilities of what really works — for us. Because in the end, that’s who it’s all about. The both of us and the celebration of our love, our bond, our relationship with the people we love. Lovely! What a fun sounding place. Love the word play. Let this be a most beautiful mutual decision. Oh, I love your honesty Louise, I guess we all have those pathways or learned behaviors. Good for you for letting some of it go. It’s recognizing it first, then trying something new. Lovely property for your Day! ❤ Bench Wines. Thank you so much Louise for this excellent blog! René and I truly enjoyed meeting you and Charles! Hopefully, we will get to see you again in the near future! Bonne Chance avec ta grosse décision! Louise you and Charles are two amazing people. Kacey and I are both thrilled to have met you and your blog is ever inspiring. Never stop smiling!